Overview - The year is 1795 and young Jane Austen (Anne Hathaway) is a feisty 20-year-old emerging writer who already sees a world beyond class and commerce, beyond pride and prejudice, and dreams of doing what was then nearly unthinkable--marrying for love, without any regard for financial well-being. If Hollywood biopics were food, 'Becoming Jane' would be a Hostess Cup Cake. It's a movie that takes one of the truly great literary observers of our time, Jane Austen, and re-imagines her life as just another standard-issue chick flick. That doesn't mean it isn't entertaining, or even an often exemplary example of its genre, but throughout the film, I still had the sinking feeling that the most fascinating aspects of Austen's life had gone unexplored. The film’s concept is that it's telling us of the great "unknown" romance of Austen's life, which would go on to inform her six monumental literary works (including such classics as "Emma," "Pride & Prejudice" and "Sense & Sensibility"). Anne Hathaway stars as the young, defiant Jane, who bucks conventions in her provincial English town, refusing to marry out of her pioneering feminist principals, despite the limited means of her mother and father (Julie Walters and James Cromwell). Jane's resilience is soon tested, however, when the dashing Tom Lefroy (James McAvoy) arrives in town. He's a reckless and penniless lawyer-to-be, and offends the emerging writer's every sense and sensibility. Soon their clashing egos set off sparks that ignite a passionate romance and fuel Jane's dream of doing the unthinkable -- marrying for love. But Jane's refusal to melt even her own heart may backfire, as Tom soon becomes engaged to another, forcing our heroine to rethink all of the ideals she thought she stood for. The romantic premise of 'Becoming Jane' is recycled from countless other romantic weepies. Here again we have two people from opposite sides of life who everyone can see are clearly meant for each other, but who don’t realize it themselves, so they spend the whole movie bickering until they finally get hit by a bolt of enlightenment. It's cute, and it's slight, and it's the weakest aspect of 'Becoming Jane.' Jane Austen was one of the most fascinating women of the past two hundred years, not to mention perhaps the most biting social essayist of her time, but 'Becoming Jane' veers awfully close to turning her into a whiny drip. Luckily, the script by Kevin Hood and Sarah Williams, and the direction of Julian Jarrold avoid belaboring such rote conventions, and instead embrace a playfulness that's rather appealing. Unlike so many period romances about repression, the world of 'Becoming Jane' is flush with lively sexuality lurking beneath the rigid social customs, and it is this shimmering tension that gives the film some genuine heat. Although I don't think Hathaway is an actress with the same range and gravity as a Kate Winslet or a Keira Knightly, she does find the right balance of desperation and barely concealed anger in Jane's predicament, which energizes her tussles with McAvoy. The pair generate real spark and chemistry, and even if 'Becoming Jane' is hardly one of the great romances of cinema, there's enough fire between its leads to hold our interest. 'Becoming Jane' is also easy on the eyes. Jarrold has a fine eye for subtle beauty in his compositions, and the recreation of 18th century England is pretty and inviting. Nearly every scene is dripping with mood and atmosphere, but even with this heightened realism, the world feels authentic, with a fully-developed community, populated by thinly-sketched but well-rounded characters. The supporting cast is quite superb, particularly Walters and Cromwell, who perfectly convey the dire predicament of the Austen family with affecting power. Ultimately, 'Becoming Jane' doesn't surmount the lightness of its approach. It's not a dumb movie, but it’s a shame it wasn't more ambitious in scope, for the life of Jane Austen is so rich it begs for a complex treatment. It is still an entertaining film, one with moments of real wit and sexiness, and it's certainly handsomely mounted. 'Becoming Jane' can't compare to the best cinematic adaptations of Austen's actual novels, such as the recent 'Pride & Prejudice' and the Oscar-winning 'Sense & Sensibility,' but for fans of the author, it's still an enjoyable little truffle. Disney presents 'Becoming Jane' in 1080p/AVC MPEG-4 video. It's a very naturalistic film, with a gentle color palette and warm textures that come through quite nicely on Blu-ray. Fresh off of its recent theatrical run, 'Becoming Jane' benefits from a pristine print, with lovely deep blacks and nicely balanced contrast. Colors are not overly vibrant, but the use of muted pinks, blues, and purples give the film an appropriate pastel sheen that almost looks impressionistic at times (particularly effective is the sharp use of natural lighting, which adds to the warmth). Fleshtones are sometimes pale and cold by design, but the superior level of detail and depth keeps the presentation looking quite textured and dimensional. Alas, there is a bit of noise on wide solid patches (though it's slight), and shadow delineation sometimes flattens out due to a few inconsistent patches of over-brightness. These are not huge defects, however, and 'Becoming Jane' holds up as a generally splendid transfer. 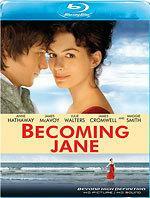 Typical of a "literary drama," there is not a lot of sonic razzmatazz to 'Becoming Jane.' The mix is largely dialogue with some nice score, but it's done effectively, I like the use of swelling music cues and sustained (if minor) ambience in the rears, especially as much of the film takes place in lush outdoor settings. If the mix is still somewhat front heavy, where this presentation shines is in the warm and spacious dynamic range. The score delivers more low hum to the subwoofer than I expected, and the clarity and spark to the high-end is very pleasing. Dialogue is also pitch perfect, as it should be. Don't expect to be blown out of the water by 'Becoming Jane,' but for what it is, it's very well done. 'Becoming Jane' is hitting Blu-ray day-and-date with the standard-def DVD, and the pair share the same extras. All the video material (except for the trailers) is presented in 480p/i/MPEG-2 video only, and subtitle options on all the bonus features include English, French, and Spanish. Audio Commentary - Director Julian Jarrold, screenwriter Kevin Hood, and producer Robert Bernstein sit down for a group chat, and it starts out strong. Hood in particular provides a great deal of insight into crafting a story that is part biopic, part made up from whole cloth, while Jarrold has fun recalling the chemistry between the leads and other on-set fun. Unfortunately, the track begins to drag, eventually falling into the trap where the participants just regurgitate what we're seeing onscreen. Had the strong pace of the first half kept up this one would have been a must-listen, but as is, it's quite hit-or-miss. Featurette: "Discovering the Real Jane Austen" (SD, 16 minutes) - Not quite living up to its title, this is hardly a doc on Austen but rather a standard making-of EPK. The cast and crew champion the script’s insights in all things Jane, and there is a wealth of film clips and behind-the-scenes footage. It's just all too generic, and barely more than an extended commercial. 'Becoming Jane' is hardly a rigorous biopic of author Jane Austen, but as a charming romantic fantasy, it's quite engaging and likable. This Blu-ray showcases great video and audio, and a nice little package of extras. For fans of the genre, or those who just want to imagine what real-life romances might have inspired their favorite Austen stories, 'Becoming Jane' is worth checking out.